I like the Sinterklaas holiday. On Saturday morning I went to the Oranjeschool, and we made special hats to wear and colored pictures to give to Sinterklaas. Then we all went to the gymnasium to wait for Sinterklaas and Zwarte Piet to arrive. There was a procession and lots of singing. After Sinterklaas sat down in his special chair, every class made a presentation, and I represented the playgroup by standing up and singing “Zie ginds komt de Stoomboot" into a microphone in front of the whole school. That was fun! 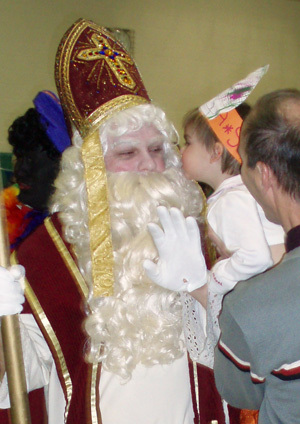 I gave kisses to Piet and Sinterklaas [left]. On December 5th Mommy made a dinner of waffles with fruit and whipped cream. After dinner was done, Sinterklaas knocked at the door. I knew immediately who it was and ran to the door. He and Piet left a bag on the doorstep! I liked opening the gifts and candy, but I got upset when everyone wouldn’t let me open theirs too, so then I got a time-out. We all received poems, and Mommy, Papa, Cameron, and Jolien read them out loud. It was a very gezellig night. I like December because we spend lots of time getting ready for Christmas. 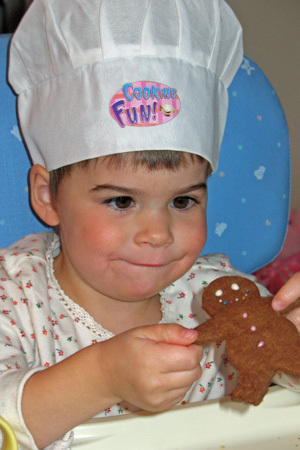 Some of my favorite things were shopping for the Christmas tree, decorating the Christmas tree, decorating the house, reading Christmas books, listening to Christmas music, and making special food. Jolien decorated a beautiful gingerbread house, and Mommy rolled and cut sugar cookies to decorate [right]. They didn’t let me do much decorating because I kept trying to lick the frosting and eat the candy. One weekend in December Papa, Mommy, Jolien, and I went to Portland to visit David and Jeanne. The drive wasn’t bad because Mommy brought DVDs to watch on a portable player. I didn’t nap, though. On the way there, we stopped at Janzten Beach Mall, and I got to ride the carousel in the mall twice and sit on Santa’s lap. I sang “Rudolph” for him, and he liked it very much and gave me a candy cane. 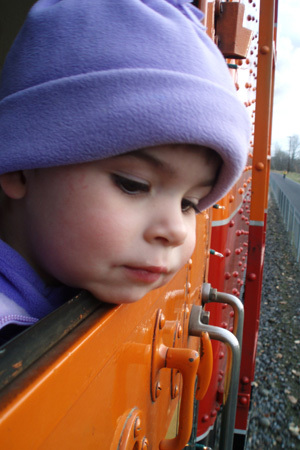 I was allowed to run around the Williamson's printing company while they gave us a tour, and they took us shopping one morning, but the best part of the weekend was a 40-minute trip on the Holiday Express, out of Oaks Park Station, pulled by a big steam engine. Inside, the train was decorated for Christmas, and Santa came through and gave me another candy cane. "We're going to the North Pole!" 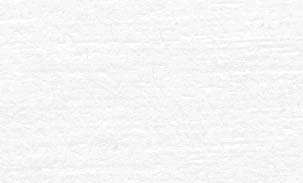 I said. I liked standing outside at the coupling just behind the engine. I watched the ground pass by [left] and the steam fill the air, felt the rocking of the wheels, and listened to the train's piercing whistle. 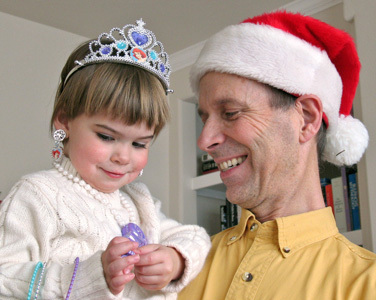 One evening I dressed up in my special party dress and shoes, and Mommy and Papa took me for an official visit to Santa at Nordstrom’s in Bellevue Square. The line was pretty short, and I was having a good time singing “Rudolph” and shouting, “Ho, ho, ho! Merry Christmas!” to everyone while we waited. The boy in front of me was afraid of Santa, but they were trying to get him to sit on Santa’s lap so they could take a photo. The next thing I knew, Santa stood up and waved goodbye. I was so excited to talk to Santa and had been waiting so patiently that I couldn’t believe that Santa was leaving! In shocked dismay, I began crying. Mommy tried to explain (that Santa was going to sneak behind the chair for a photo with the boy), but I was already too upset. Then Santa waved at me from behind a rack of clothing and Papa carried me over. Santa kindly explained that it was okay, that he wasn’t leaving and I would be with him next, so I stopped crying and got back into line. 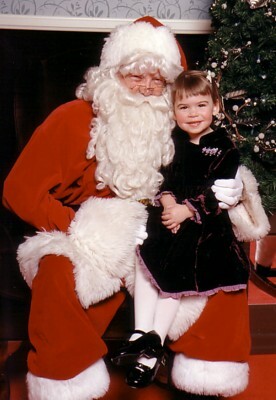 Once the little boy was gone and Santa started to settle into his chair, I ran to him as fast as I could. Santa said, “Sofia, I love you. I wouldn’t leave you. You’re my angel, and I’m going to bring you lots of toys.” Then I felt a little shy and couldn’t talk, but Santa hugged me [right] and gave me two candy canes, one for each hand. When we left, Santa called out, “Goodbye Sofia! I love you!” I love you, too, Santa. On Sunday, December 24th, the family drove to downtown Seattle to see the Christmas sights. 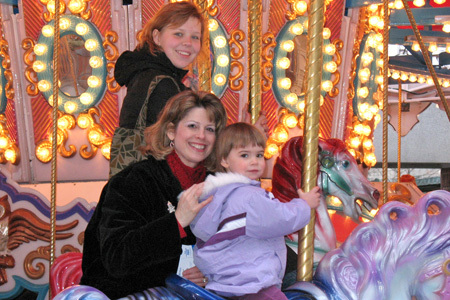 Mommy, Jolien and I rode the Christmas carousel. I sat on a beautiful purple horse [left] and waved at Cameron and Papa as we circled. This year I was good and didn’t scream, like last year, when it was time to get off. It began to rain, but we walked to City Centre to see the fancy gingerbread houses. There were gingerbread tree stumps full of animals, gingerbread skyscrapers, a gingerbread Pike Place Market, and even a gingerbread city in a snow globe. I’ve never seen so much candy in one place!! Then we walked to Westlake Center and Mommy, Cameron, Jolien, and I rode the Monorail to the Seattle Center. (Papa stayed behind so we wouldn’t have to pay for a round trip; he brought the car later.) We went to the Center House and watched the model trains go round and around the winter village. Then we got hot chocolate and went outside to watch the Center fountain. It was raining and cold, but I loved the fountain because it was exploding with noisy canon bursts of water that reached so high they seemed to touch the sky. What a fun day! For Christmas Eve we went to Grandpa’s house. I went upstairs and watched DVDs with Cameron and the other kids, Jennifer and Erika Feutz. They played with me, and I liked them very much. There was too much excitement to be hungry, so while everyone else ate dinner, I played with a box of toys near the Christmas tree. I did eat Christmas cookies for dessert, though! Next, Jenny and Erika sang some Christmas songs and played the piano. While they were singing, I joined in dancing. All the grownups laughed. Finally it was time for gifts. Papa helped me open a doll from the Buckinghams [right], a magnetic book from the Feutz family, and a dress from Bonnie. 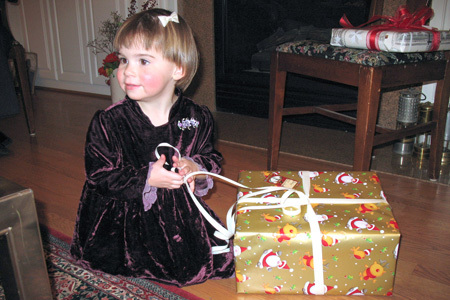 I liked opening presents, and I watched and helped everyone else, too. Mommy told me I was cooperating because I didn’t fuss about putting on my pajamas before the car ride home. I was too excited to actually sleep in the car, though. And I only closed my eyes in bed when Mommy reminded me that Santa wouldn’t come until I fell asleep. On Christmas Day, Mommy and Cameron woke me at 8:00. I ran around upstairs until Cameron reminded me that Santa had left presents downstairs. 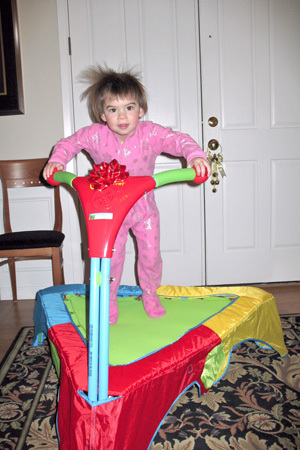 From the top of the stairs, I spied my first gift in the foyer, a trampoline just my size. I scrambled down the stairs and began jumping immediately [left]. “We’ll take it to Miss Julie (my teacher at Wiggle Worms)!” I said. Then we all went to the family room and unpacked our stockings. I got some candy, soaps and bath sponges, miniature trucks, and a bracelet. I also opened my other Santa presents under the tree, a Little People preschool set and a Groovy Girls doll named O’Ryan. Then Grandma Joanie arrived, and the next couple hours were filled with flying paper and ribbon, although we took turns to open our gifts. At about 10:00 I threw a tantrum, so Mommy took me upstairs for some quiet-time reading, and I calmed down. Back downstairs again, I opened the rest of my gifts and helped everyone else open theirs. I especially liked the fire truck from Grandma, the miniature Disney princess dolls from Cameron (changing their clothes is especially fun), the doctor kit from Joseph, and the Ariel jewelry from Jolien [right]. I put it all on and paraded like a queen. At noon, we all sat down in the dining room for brunch. I liked Grandma’s French toast but not much else. Then Grandma, Mommy, and I drove Cameron to Mr. Scott’s house. He and Suzy gave me presents, too! Once back home again, I settled down for a nap. We had a small dinner because we were all full from brunch and Christmas goodies, and I ended my day playing with a new bath xylophone and flutes in the bathtub and reading “A Lucky Dog” sent for Christmas by Aunt Patty. Isn’t Christmas wonderful? 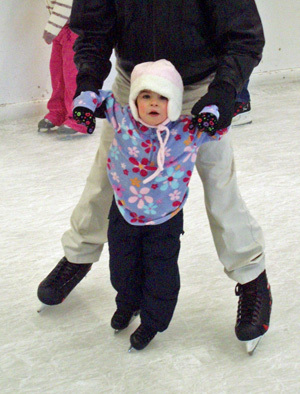 On December 27th, Papa and Jolien took me ice skating at the Seattle Center’s Winterfest skating rink. I was eager to try the skates, but I didn’t like the crowds of kids and the noise. Sometimes Papa helped me [left], and sometimes I used a special metal frame to hold me up. Given that it was my very first time on ice skates, I think I did pretty well! For New Year’s Eve we went to Joseph’s house. The Tucker family, with three boys, was also invited, and all the noise and testosterone were a bit overwhelming. Do you know that boys just yell…for no reason? Still, I wouldn’t let them get the best of me. Dinner was much less interesting than all the toys and commotion; I liked watching the boys wrestle with Jolien. 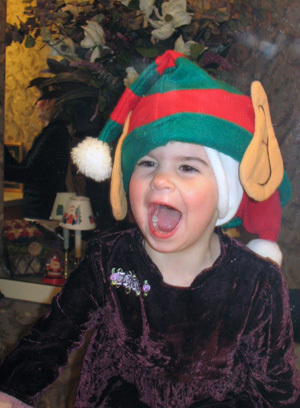 I also liked wearing Joseph’s elf hat [right]. My usual bedtime is 8:00, but we stayed up till 9:00 to watch midnight in New York on the TV while we made even more noise with squawkers, clankers, and clappers. I was very tired, but Papa had to carry me out to the car screaming because I didn’t want to leave.